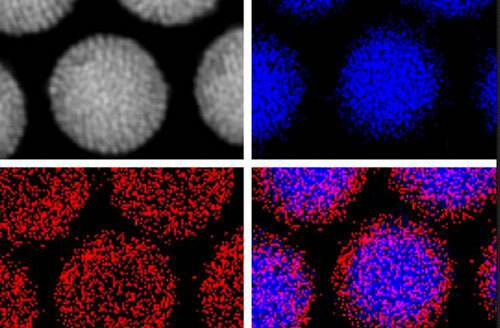 (Nanowerk News) A long-sought goal of creating particles that can emit a colorful fluorescent glow in a biological environment, and that could be precisely manipulated into position within living cells, has been achieved by a team of researchers at MIT and several other institutions. The finding is reported this week in the journal Nature Communications ("Magneto-fluorescent core-shell supernanoparticles"). The new technology could make it possible to track the position of the nanoparticles as they move within the body or inside a cell. At the same time, the nanoparticles could be manipulated precisely by applying a magnetic field to pull them along. And finally, the particles could have a coating of a bioreactive substance that could seek out and bind with particular molecules within the body, such as markers for tumor cells or other disease agents. “It’s been a dream of mine for many years to have a nanomaterial that incorporates both fluorescence and magnetism in a single compact object,” says Moungi Bawendi, the Lester Wolfe Professor of Chemistry at MIT and senior author of the new paper. While other groups have achieved some combination of these two properties, Bawendi says that he “was never very satisfied” with results previously achieved by his own team or others. Moreover, Bawendi says, “We wanted to be able to manipulate these structures inside the cells with magnetic fields, but also know exactly what it is we’re moving.” All of these goals are achieved by the new nanoparticles, which can be identified with great precision by the wavelength of their fluorescent emissions. The new method produces the combination of desired properties “in as small a package as possible,” Bawendi says — which could help pave the way for particles with other useful properties, such as the ability to bind with a specific type of bioreceptor, or another molecule of interest. In the technique developed by Bawendi’s team, led by lead author and postdoc Ou Chen, the nanoparticles crystallize such that they self-assemble in exactly the way that leads to the most useful outcome: The magnetic particles cluster at the center, while fluorescent particles form a uniform coating around them. That puts the fluorescent molecules in the most visible location for allowing the nanoparticles to be tracked optically through a microscope. “These are beautiful structures, they’re so clean,” Bawendi says. That uniformity arises, in part, because the starting material, fluorescent nanoparticles that Bawendi and his group have been perfecting for years, are themselves perfectly uniform in size. “You have to use very uniform material to produce such a uniform construction,” Chen says. Initially, at least, the particles might be used to probe basic biological functions within cells, Bawendi suggests. As the work continues, later experiments may add additional materials to the particles’ coating so that they interact in specific ways with molecules or structures within the cell, either for diagnosis or treatment. A silica coating on the particles allows additional molecules to attach, causing the particles to bind with specific structures within the cell. “Silica makes it completely flexible; it’s a well developed material that can bind to almost anything,” Bawendi says. For example, the coating could have a molecule that binds to a specific type of tumor cells; then, “You could use them to enhance the contrast of an MRI, so you could see the spatial macroscopic outlines of a tumor,” he says.